So far behind on this blog! I apologize to both of my readers, but I’d swear I had documented this pizzeria because we had so much fun eating there! 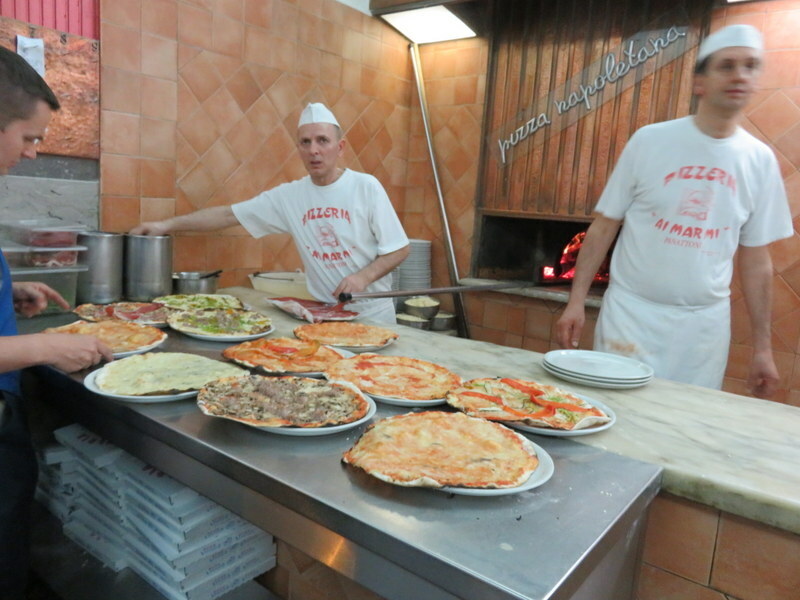 Ai Marmi pops up on best-pizza-in-Roma lists from time to time. Ric and I were going to go to Ai Marmi once a couple of years ago but we were put off by the school cafeteria interior and the hordes of people inside. Plus it was, as I recall, hotter then blazes that evening, so we retreated to Dar Poeta only a half-kilometer away. I kept seeing Ai Marmi come up on lists, so I buried my resentment of non-charming restaurants and we headed over to Trastevere one lovely April night, arriving early, i.e., about 7:30pm. 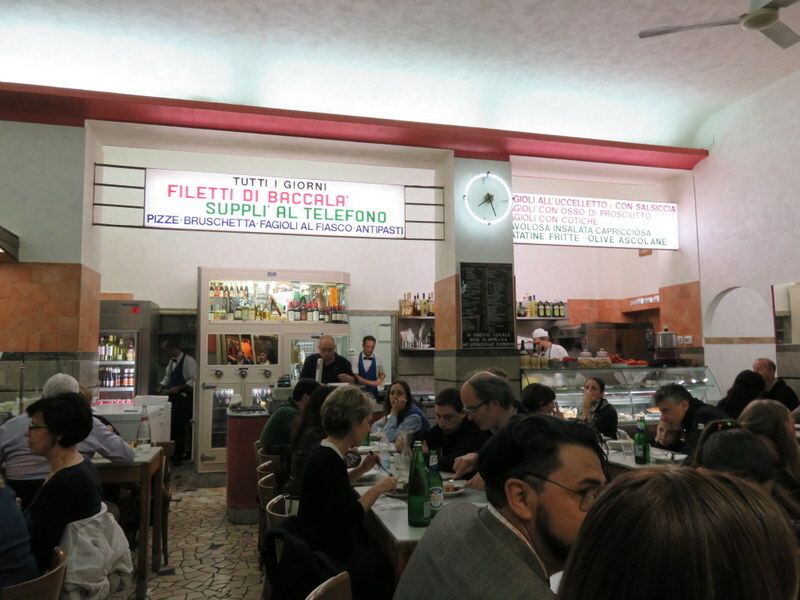 Roman pizzerias usually peak about 9:00pm, and this one was legendary for attracting crowds.Why? Good product and low, low prices. The school cafeteria atmosphere does not scream romantic dinner, but it is efficient. This is not the very best pizza in Roma. I reserve that honor for Dar Poeta, Da Remo, and La Pratolina. I’d probably put 72 Ore in this list, but we’ve only eaten there once so I cannot fairly rank it in my top picks. Taverna Rossini gets a nod for a good package: location, service, pizza quality, but it is expensive. While not the best, AI Marmi is worth putting into the rotation. It is low key, non-fussy, fast-paced, cheap. We were seated right in front of the pizza prep area. Nothing is hidden here. The chaps were pounding out crusts (no show-offs flipping dough in the air), ladling sauce, heaping cheese, sprinkling on the goodies, and firing the pies in the wood-fired oven. Pies came out of the oven in about 3 minutes. Pizza prep-and-cook area. It was like a floor show. It was fun to watch them work and the crowd put them to the test. Shortly after we arrived, folks started streaming in. By 8:00 it was almost full. The guys would lay out a dozen pizzas at a time and shuffle them in-and-out of the hot oven. Waiters whisked the pies to tables inside and outside. Service was so fast that in 45 minutes we were ready to pay our modest tab and head off into the gentle spring evening. Pizza Quality: 3 A reluctant 3. It’s not Dar Poeta nor La Pratolins, but it has a thin, Roman crust. Loved my anchovies, although there could have been a few more. Service: 3 Nice waiters, bi-lingual, efficient. Not there to make friends with you; they do their job. Ambiance: 1 Yes, they have outdoors seating, but it’s pretty functional and on a terribly busy street so no ambiance. Inside will win no beauty awards. It is clean. Ai Marmi on Viale Trastevere. Raw pies ready to hit the fire. My pizza Napoli, of course. Delicious suppli, a Roman staple before pizza. You’ll love it! Try to sit by the pizza prep area so you can watch the floor show! Suppli’ al Telefono is the term for a proper suppli where the mozzarella inside stretches between the halves as you bite into it, like a telephone cord. In my experience, it doesn’t always happen so beautifully like Ric demonstrates here: https://ourweeklypizza.com/2014/11/20/da-remo-november-14-2014/. There’s one for my list. You know we don’t go for atmosphere. Couldn’t make out what is meant in the first photo by Suppli’ al Telefono. Completely stumped.